Rosslyn, in Arlington County, is located directly across the Potomac River to the southwest of Washington, D.C. Formerly part of the District of Columbia, the land now composing Rosslyn was retroceded to Virginia on July 9, 1846, in an act of Congress that took effect in 1847. It is considered a Central City of the Washington Metropolitan Area. With this premium location outside of Washington, D.C., luxury apartments in Rosslyn are in demand. Those with jobs or business to take care of in the Metropolitan Area have easy access to centers throughout D.C. and just outside in Virginia. The area is a short drive over I-66 and the Theodore Roosevelt Bridge from the Capitol, with the Kennedy Center, Lincoln Memorial, Washington Monument, and the White House just minutes away. If you are looking for Rosslyn apartments for rent, Keener Management operates The Taylor apartments, located on 21st Road North. Residents are in walking distance of Fort Bennett Park and the Potomac River. 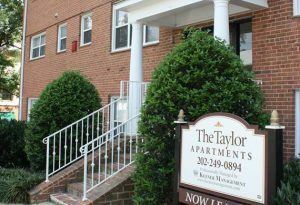 Nearby shopping and dining destinations, as well as schools, make The Taylor a desirable complex for those in the area. This heavily urbanized part of Arlington County, Virginia, affords easy access to the nation’s capital by way of the Theodore Roosevelt Bridge, which enters Washington, D.C., near The John F. Kennedy Center for the Performing Arts. The Lincoln Memorial, Vietnam Veterans Memorial, World War II Memorial, and Washington Monument are close by. Take the Frances Scott Key Bridge and you enter Georgetown, a lively neighborhood that’s the home of Georgetown University, a waterfront park, and a plethora of stores and restaurants. Luxury apartments are also not far from the city’s main attractions, from museums to cultural landmarks to political hotspots. Visit the Smithsonian museums or see your favorite sports team at the Capital One Arena. The property is near George Washington Memorial Parkway, Curtis Memorial Parkway, and Lee Highway. If driving isn’t an option, buses run into the city, and Rosslyn Station on the Metro (served by the Blue Line and Orange Line) is easily reached on Fort Myer Drive in the heart of the business district. Aside from being a transportation hub of highways and rail lines, the area has many cycling and pedestrian trails, so you can easily get around from your apartment in Rosslyn. 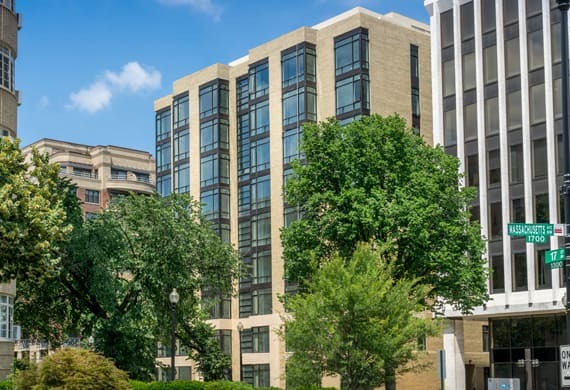 Our Rosslyn apartments are within walking distance of the Potomac River and Potomac Heritage Trail. One can reach the Custis Trail along I-66 to the Mount Vernon Trail that runs alongside the Potomac River. The Washington and Old Dominion Railroad Trail is accessible via the Custis, and extends 45 miles into Northern Virginia, but some trails extend into Washington, D.C. as well, including the C&O Canal towpath and Capital Crescent Trail. The nearby Fort Bennett Park and Palisades Trail offers 11 acres of outdoor space. McCoy Park offers paved walking and biking paths, and green space to enjoy a picnic. Gatherings of family, friends, and their kids take place at Dawson Terrace Community Center and Park Grounds. For culture, visit the Rosslyn Spectrum Theatre. The area is home to events such as the DC Independent Film Festival and Rosslyn Jazz Festival. Also, the Art Institute of Washington is here; it is based on North Fort Myer Drive. As for restaurants, you’ll find American, Mediterranean, Thai, French, Italian, and Middle Eastern fare. From pizza and burgers to seafood, the area pretty much has it all. Roti Modern Mediterranean is a local favorite; known for its hummus, falafel, and house-baked pita bread and vegetable side dishes. But if you like fresh turkey sandwiches, Capriotti’s is just the ticket. Then again, MOM’s Organic Market is a bit closer, if you desire naturally sourced produce, sustainable seafood, and natural cosmetics. There is much to do, see, and eat close to The Taylor apartments in Rosslyn. One-, two-, and three-bedroom apartments are available with spacious open floor plans. In addition to wood parquet floors, residents have the luxury of a washer and dryer, large closets, and fully equipped kitchens and bathrooms. Not to mention proximity to work, restaurants, entertainment, and historic and cultural destinations within Washington, D.C. Learn more about The Taylor and check availability by contacting us at taylor@keenermanagement.com today.